I just wanted to post a small update. I’ve had a very busy week so far, so there haven’t been so much time to work with this guy. But the modeling is starting to get in place. I need one more session with him and then the modeling should be more or less finished. I have two more accessories left to model for him and some additional details to add to his body. I hope to be able to have that session this evening. I make this project to improve my texturing skills, so I wanna spend the most time in that area. But I have also dedicated quite some time now to explore a new flow for my detailed modeling. I have experimented with a new method that I kinda am starting to like a lot. LightWave 3D -> ZBrush -> Modo -> LightWave 3D. 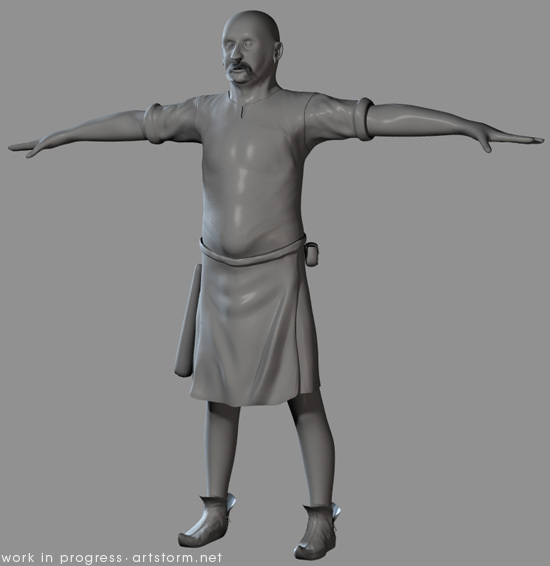 My flow goes like this, I rough out the overall shapes I am looking for in LightWave, his body and his different pieces of clothing. Then I bring the meshes into ZBrush, one at a time, and start sketching and sculpting out the details, like wrinkles in the clothing. When I have something I am happy with, I export them out in hires into Modo. 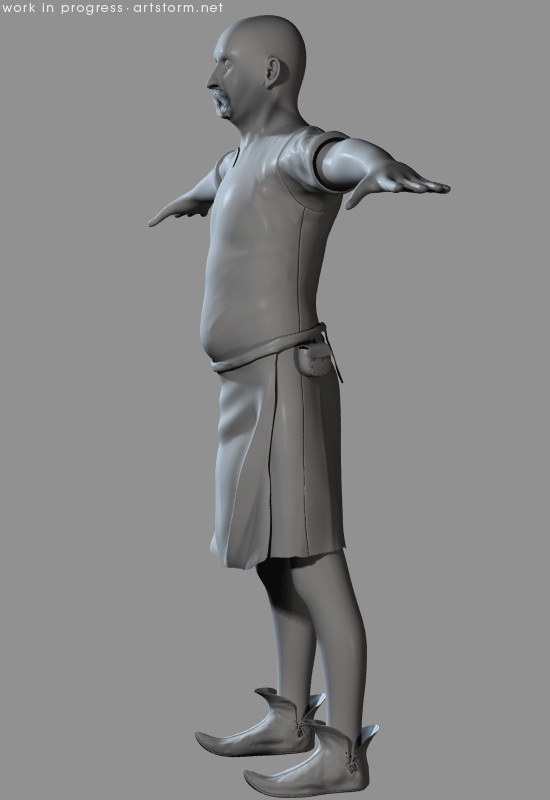 And there I rebuild the clothing from scratch again, using the hires mesh from ZBrush in the background. The Pen Tool in Modo in quad mode with a background constraint is just wonderful for this work of creating new topology on an existing mesh. So by doing it like this I get a pretty low polygon mesh, with an excellent flow of edgeloops with as much details as I can preserve modeled in, carefully laid out in Modo where I need them. And when I am done in Modo, the model goes back to LightWave to replace the first rough draft version. Amazing looking model really like it.